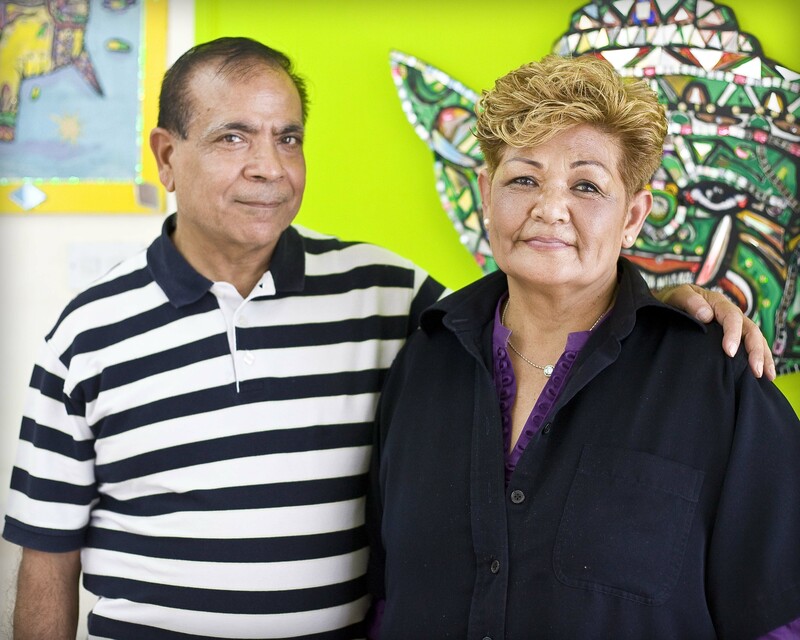 Pam & Raj Chawla, proprietors of “Mama Thai,” began selling noodles from a wooden hut in the Spitalfields Market on the very first day it reopened after the wholesale Fruit & Vegetable Market moved out in 1991. In those days, I used to go every Sunday and buy my week’s supply of vegetables from the stalls, and then perch on a bench in the cavernous empty market to wolf a steaming plate of Mama Thai’s spicy noodles with chilli sauce. Before the renovations, there was a train set that gave rides around the market, football pitches and all kinds of community events, of which the dog show was most notable, and, sitting amongst all this chaotic life, Thai noodles were the perfect meal to warm my body and raise my spirits after hours of trudging around Columbia Rd and Brick Lane in the frost. Today Pam & Raj have a shop at the corner of Toynbee St and Brune St, fifty yards down a side street from Christ Church, Spitalfields, where hordes of office workers come every day with long lists of orders to carry off dishes of their delicious and keenly priced noodles and curry for lunch. A cooked meal for under five pounds is rare now – especially in Spitalfields – yet at Mama Thai you can buy good quality food prepared daily in the kitchen from fresh ingredients, with a drink to accompany it too, and get change from five pounds – vegetarian dishes are £3.50 and meat dishes £4.50. There is a touching egalitarianism about this welcoming brightly coloured restaurant, run with pride by Pam & Raj for a loyal coterie of over five hundred regular customers, who keep coming back to show their appreciation every week. In these sweltering temperatures of midsummer, I find it as restorative as in the chills of midwinter to enjoy a plate of spicy noodles with chilli sauce – so, photographer Jeremy Freedman and I have enjoyed memorable lunches at Mama Thai’s twice this week. Jeremy likes mild curry while hot noodles are my penchant. Over the nearly twenty years I have been eating Mama Thai’s noodles, I have learnt the fine art of applying the chilli sauce sparingly – enough to make the mouth sing, not so much as to burn my tongue. It is a lesson I acquired haphazardly through ceaseless experimentation, which taught me always to keep a glass of water to hand in the early years, though readers with a delicate palate can be reassured that a range of milder flavoured dishes are also available. Although, in the last twenty years, Mama Thai has only moved a few hundred yards from the Spitalfields Market to Toynbee St, this story began far away on another continent. It is a saga that involves a lot of hard work, and romance too, culminating in this present happy moment, the apogee of Mama Thai. Raj Chawla, our hero, is a restless spirit with perceptive dark eyes, who won a scholarship from India to study in Germany and, upon his return in 1971, decided to seek a life in Thailand. There he learnt to cook in an American grill and managed a German restaurant in Bangkok, living above the shop. It was there that the demure Pam, our heroine, caught his attention when she came to sit in the restaurant, engendering a tender romance which continues to this very day, as the picture above testifies. Together, the couple came to London in 1975 on a work permit to study hotel management, starting a stall at Camden Lock each weekend selling noodles cooked by Pam, who like many great cooks is self-taught, improvising her dishes and learning through experience. Thinking back to when I used to buy noodles from Mama Thai in the Spitalfields Market to warm myself in the Winter years ago, I wonder what it can have been like cooking and selling noodles all day in a freezing wooden hut, with a large serving hatch open to the air. Yet the scrupulous cleanliness of Mama Thai’s restaurant reveals that Pam is a hardy spirit, who works from nine until nine each day, scouring the entire place top to bottom at the end of service to create the immaculate environment she requires to cook her subtly spiced dishes and present them beautifully next day. 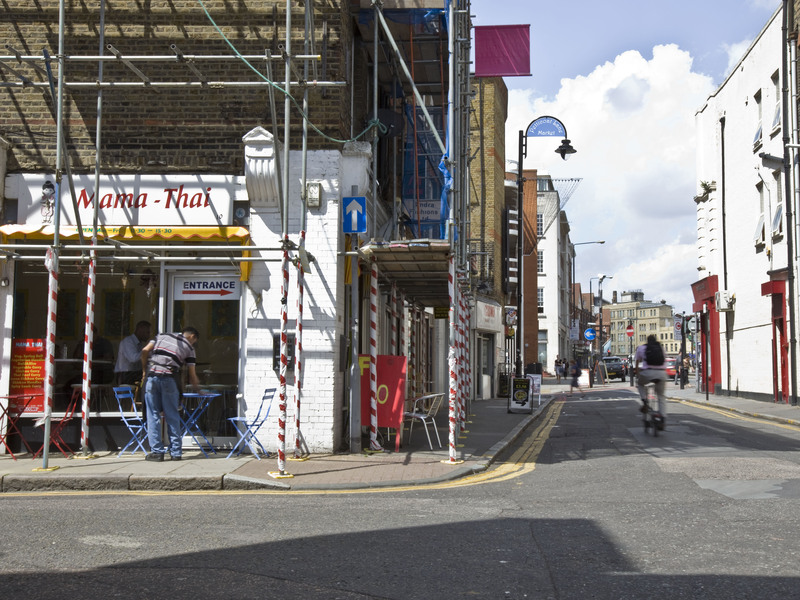 On the first day trading in Spitalfields, Mama Thai took just twenty pounds, but over time business grew to capacity. Then, in spite of Pam & Raj’s perseverance, Mama Thai had to leave the market when the renovations replaced the wooden huts with steel and glass spaces – now occupied by franchised chain restaurants – which command a rent far beyond the turnover of a small independent trader. It took Pam & Raj a year to find the current premises, but it is a credit to their tenacity (assisted by long-term collaborators Ooma and Peter) that today while those homogenous restaurants are closing in their expensive central locations, Mama Thai is deservedly thriving in this side street where discerning thrifty diners seek it out. Last year, Raj took retirement after nineteen years at his day job at the post office and now Pam is teaching him to cook vegetarian dishes. “She’s the boss,” declared Raj with the cheeky grin of the student on a scholarship in a foreign land, indicating Pam, who glides around concealing her deep concentration with effortless poise and an easy smile. Possessing the perfect hair, make-up and inscrutable grace of a forties screen goddess and ruling the kitchen with unspoken authority, Pam is capable of speaking volumes simply by raising a single eyebrow, which was exactly what she did at that moment, eloquently confirming Raj’s statement. I was putting away my notebook, ready to order lunch, when a passing office worker, shovelling noodles into his mouth with clownish delight as he walked out the door, announced spontaneously to the world, “This is where I come when I’m hungry!” Pam & Raj laughed, because he proved their point – out of their intelligence and talent they have created a beautiful situation offering good food that everyone can afford and we love them for it. So great that Mama Thai has managed to carry on and find new premises in Spitalfields. The corporate ‘blandification’ of Spitalfields Market is such a shame. Let’s hope all the chain restaurants close down and the small independents can take over again. What a beautiful story and one that I hope will continue to be told.I can’t wait when I am next in Spitalfields to visit the noodle store. Great story. Next I come down there I must eat here. Does anyone remember the Emmet sculpture that stood in Spitalfields market in the days before the market was ‘spruced up’. Not sure if it was the same one that was for a time in a shed in Trinity Buoy Wharf being renovated. Emmet’s sculptures always make people smile. Jimmy Cuba. This is shaping up to be a story on a par with the missing Euston Arch. Perhaps Spitalfield’s residential architectural sleuth could be called upon? Can’t imagine the Emmet would have much scrap value – not like a Henry Moore bronze. Mamma’s is the best lunchtime venue in the EC3 area, been going for years and the phrase ‘going for a Mammas’ is in daily use in our office. The pumpkin dish is the food of the gods. Mama Thai’s is one of my favourite places to eat when I’m having a bad day. Even though there is usually a big queue, the thought of getting lamb and pumpkin cheers me up no end. The service is superb and I feel that my custom is really appreciated. Peter is my favourite member of staff. I make a point of eating at Mama’s whenever I am in the area. They are such a friendly crew & when I pop in late Mama always gives me a massive helping that does for dinner as well. I will support them as long as they are there. I have eaten various take away curries over a lifespan of nearly 40 years and in that time I have found that Mama Thai’s lamb curry is the very, very best curry I have ever tasted. It oozes taste and it so reasonably priced, when compared with the other offerings out there in the lunch time market. I would definitely recommend Mama Thai to anyone who indeed wants a spicy curry for lunch in London. Hats off to them all for such lovely food for all these years ! Amazing Friday lunch with with my colleagues from work Lovely food, big portions. Went there this Friday and still very very good, totally recommended especially the pumpkin, aubergine, dall, spinach … well all of it !! People travel 10 miles to get to your curry. This shop is more important than the general election. Nice food.